Automatic Seat in the Series Tournament of Champions. Tournament Points based on chart. High Hand: Win a hand with 4 of a kind or better using both hole cards. 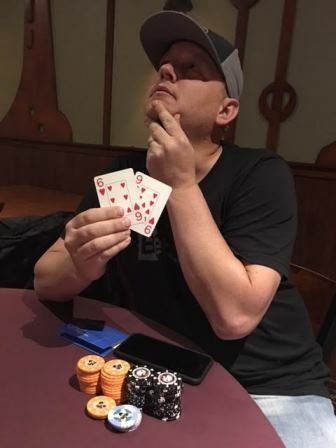 2000 chip re-entry into the main tournament. Includes Bar Staff and Tournament Staff tips. Does NOT include Pull Tabs. Belated if your Birthday falls in a Holiday or Championship week. Seats available to the top 25% in the Series with a minimum of 35 seats. In the case that a qualifier does not show before 6:45, alternates will be able to claim those seats. Alternate Seating will be based on point standings. Minimum of $100 first place prize. $1 is added to the prize for each unique individual that plays in the series up to a $200 State Law maximum. 100 Bonus Chips are awarded for each event played in the series (1600 Maximum). Qualifiers need to register prior to 6:45 to receive their Bonus Chips. Alternates must check in prior to 6:30 to receive their Bonus Chips. Tournament Points from all of the leagues are accumulated for the 6 month season to determine the Chase Champion. The Top 64 players in the Chase for the Championship qualify for the Grand Championship. This is a 10,000 chip deep stack tournament.